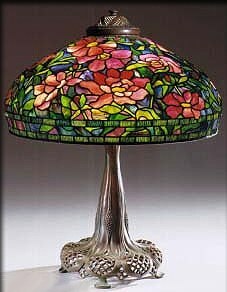 This is a colorful, large 22 inch "Peony" table lamp, shade model #1505. The base is a standard, reticulated "Library" base, 6 lights, cast stem, large, model #397. The shade has vibrant pink and red colors.